Stavanger is located on a fjord on Norway's southwest coast, and most military members assigned to the area have NATO jobs at the Joint Warfare Center (JWC) in Jatta, about eight miles to the south. A few Air Force members work at the 426th Air Base Squadron, the servicing organization also located in Jatta. It provides all the normal base-level support, to include legal, medical, accounting and finance, transportation, MWR and supply. Stavanger is the place where the contrast between the old and new Norway is most noticeable. Around it there is the tourist Norway of thatched roofs, wooden houses and fish set out to dry in the air. But at the same time Stavanger is the center of the North Sea oil industry. The population today is 117,315. The weather in the winter is cold with snow or rain and in the summer varies from hot and sunny to chilly with rain. The city has several beautiful lakes, which are popular recreation areas. 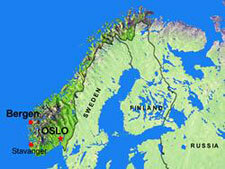 The location around Stavanger was probably one of the first areas in Norway to be settled. Presumably these first settlers came from other North Europeans countries some 12,000 years ago. At that time most of the North Sea was dry land. The Joint Warfare Center (jwc) is a nato organization that was established in Stavanger on 23 October 2003. It promotes and conducts nato's joint and combined training, experimentation, analysis and doctrine development processes to maximize transformational synergy and to improve nato's capabilities and interoperability. The jwc also assists allied command transformation with development work on new technologies, modeling and simulation. The JWC Sports and Recreation Office provides a variety of different services, and there are swimming, tennis and raquetball facilities in the local community. JWC has diving, football, golf, rod and gun, sailing, winter sports and volleyball clubs. Weeklong instructions in cross-country skiing in the winter and sailing in the summer are available. Equipment for both is plentiful for nominal fees and sometimes gratis. Army Air Force Exchange Service (AAFES) operates a Base Exchange. It stocks the same types of merchandise as larger military exchanges and commissaries, though in a smaller variety and with fewer specialty items. Special orders may be accepted with delivery expected in two to four weeks. Due to its remote location Stavanger only offers education through a non-DoDDS school. The 500-student International School of Stavanger (K-12) conducts classes in English and DoDDS funds enrollment for all command-sponsored minor family members. Free transportation is also provided. It is important to note that there are no military medical or dental facilities at JWC nor within the National Support Elements. This means that both medical and dental care will be with local Norwegian health-care professionals. Both medical and dental care in Norway is of very high quality; however, it can be more expensive than elsewhere. Health care professionals also generally speak very good English. JWC itself does not maintain housing units for members and their families. All personnel reside on the local economy, throughout the area, using private lease arrangements. Though it doesn't operate a housing office, the Host Nation Support section can provide advice in a search for housing. Household current in Norway is 220 volts, 50 cycle, but transformers to convert it to 110 are available at the exchange. TV in Norway uses the European PAL system and there are no broadcasts using the American NTSC system. However, the radio and TV programs of AFN are available by satellite, and American TVs and VCRs should work with a transformer. There are video rentals at the shoppette, which also sells multisystem TVs & VCRs.